There’s no better place to play with fun, stylish decor than in your home-based workspace. Unlike the rest of your home, your office can march to the beat of its own drummer, as long as that drummer is helping you harness your creativity and plow through your to-do list. Check out a few of our favourite stylish decorations that will help enhance your home office. A mirror in a home office? Of course! Mirrors add light and dimension to a space, which is exactly what you’ll need to help keep you awake as you sift through your monthly bills. Plus, if you need to run out of the house in a hurry to meet with a client or pick up your kids, you can do a quick spot-check to make sure you look pulled together. We love the floating wood floor mirror from West Elm (above) for $399. There’s no need to outfit your home office with boring desk organizers or file boxes. Look for interesting baskets, boxes and hard-sided tote bags to store your papers and supplies. For a modern decor, consider storing files and notebooks in an open wire basket like this one offered at Crate&Barrel for $16 (seen above). 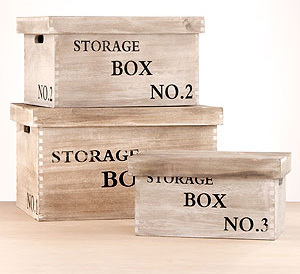 If you’re going for a more vintage look, stock up on Cost Plus World Market’s Lida Wood Storage Boxes to stash your office supplies and mail. You can pick up a set of three for $49.99. Your home office shouldn’t feel sterile or institutional; it should feel comfortable and homey! Pick out a few pieces of furniture in interesting accent colours. 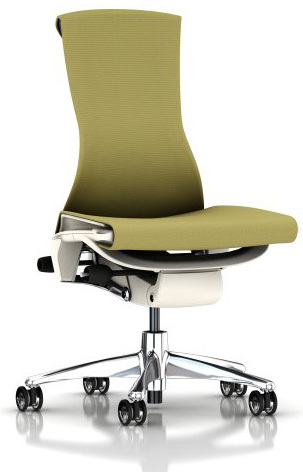 For instance, ditch the typical desk chair and choose this high-quality ergonomic Embody Chair in white and kiwi from Room & Board. Then, pick out a comfortable arm chair for the days when you want to kick back and relax while working on your laptop. 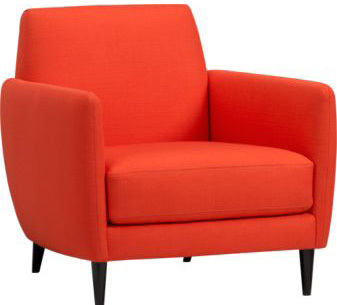 We love CB2’s Parlour atomic orange chair as one bright and fun option. Every woman needs an organizational system that keeps to-dos, calendars and other pertinent information right at her fingertips. You may not have the luxury of displaying your entire life’s agenda on your walls at work, but there’s nothing stopping you from doing it at home! 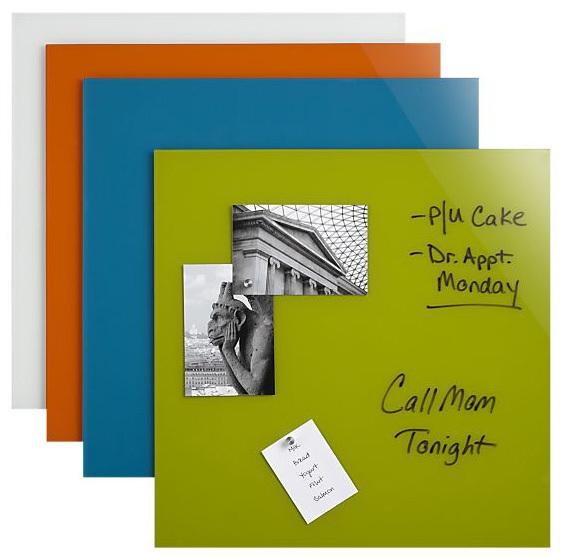 If you’re the kind of woman who likes to keep things colourful, check out the Crate&Barrel glass wipe boards in orange, blue and lime green (seen left). You can display a series of them on your wall, each one designated for a different purpose. 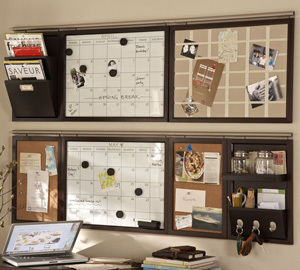 For the traditionalist, create your own organizational wall using pieces from Pottery Barn’s Daily System (seen right). The espresso finish blends nicely with almost any decor, and you’ll love being able to pick and choose from a wide variety of organizational pieces like a magnetic whiteboard calendar, linen pinboard, chalkboard and more.